It’s another hot day. Went to sit on our outdoor lawn swing for a bit but unfortunately I had a load in the dryer and the hot air spews out right on the swing. The shady side. The part where it made the most sense to sit. Not. Just read a brief scary article on blue light (the kind that comes from computers) about making one go blind. Hmmm? Since I already have vision trouble and I think it might very well have something to do with all the computer work I have done – I am thinking. Maybe . . . doing a daily message is not such a wonderful idea? I love doing it – but maybe it is not such a good idea. 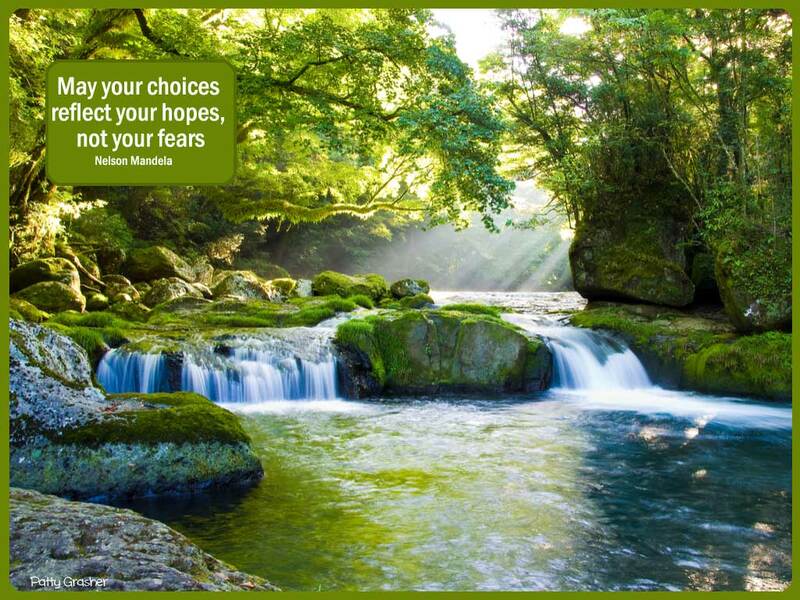 Which is funny because the quote I picked for the day is about making choices on hopes not fears. . . And anyway maybe it’s not even good to tempt anyone else to spend more time on the computer reading these messages. 2. Eating chocolate chip cookies. Yes, I made them. 3. Big dog, Andre sleeping next to my chair. I think whatever you decide and whatever is best for you , do it. I enjoy the blog, it is great. Maybe once a week. ? Your tap class sounds like a fun thing to do. Hello …. I would miss you and your daily posts but completely understand you have to make the decision that’s right for you. Without your posts I would never have heard about the yummy salmon burgers from Costco. YES, I FINALLY got there, purchased them and grilled one last night for my dinner. I’m in agreement with you, they are very tasty. So glad your son is home safely on his cruise! Used to be we didn’t worry so much about cruises but nowadays it seems like any long vacation – anywhere – is a bit worriesome. I cannot believe the floods you all are having and everywhere. I just shake my head every time the news is on. Totally unbelievable.